In the last 3 years of nomadic travel we have travelled on over 50 flights across several different airlines through 50+ countries. We’ve had arguments with security personnel in Las Vegas and made the most out of budget flights across Australia. And while most planes have many things in common the security to get onto the plane varies greatly. There have been times we could get things on planes that were simply astounding, and other times the most mundane objects were not permitted. So during a recent flight I documented the more bizarre things we have taken or were unable to take on carry-on. Vegemite – In London our Vegemite was confiscated. It isn’t a liquid, but we all know it taste’s better than Marmite so clearly the security staff were after some good tasting spread for afternoon tea. Ball – My son brought an inflatable rubber ball in Bulgaria and travelled on many flights throughout Europe with it – Bulgaria to Poland to Hungary to United Kingdom to Romania to Qatar to Bali. On our flight from Bali to Australia Air Asia security (not airport security) confiscated the ball. There were many tears. And my son cried too. Water – We’ve had arguments around the world with security staff who tried (successfully or not) taking water off us. In Vegas they tested it in a special machine so we could keep it if necessary. In Southeast Asia when we said it’s for the children they asked us to take a sip to test it. Razor – At one particular airport they confiscated my water, but the razor was no problems. Really, how much damage could I do with a razor compared to my bottled water? Scooter – I read online that various people claimed they took scooters on flights as carry-on. When we tried we were told that it was too much of a weapon and were asked to place it in oversized baggage. Redcard Resales - Ice climbing screws and ice axes got through security on my carry-on one time. Kinda scary! Luke - When I migrated Megan packed a bag of raisins in my luggage. Almost got a $300 fine. Lisa - My face cream was taken, but they let me take a razor on the same flight. Chloe - My husband was able to get his diving knife through Heathrow to Bangkok, then onto Cambodia then to Malaysia and then to Bali, in his hand luggage! When we were leaving Bali to fly back to Bangkok we twigged that this may have been sheer luck. Lucy - This one time (lol) I had this vaginal itch cream, that after the scan, the male security guard had to get it out and yeah, throw away. It was hilarious. JesseJames - My hubby had his new roll of duct tape taken away from him at security. We needed it in case we had to mend our bags at the other end. Kerry - My sister-in-law got a newly purchased set of steak knives home in her carry-on luggage (accidentally) and security did not detect them. I couldn't get home a wheel of cheese I purchased at the airport in Paris (CDG)! I guess they were hungry! Aimee - I've had a small multi-tool on a keychain taken away, and once my clip-on hand sanitizer. In 2010 I went to Jamaica with police-grade pepper spray in my purse. Left through two U.S. airports and didn't think about it. I realized my mistake when security checked my purse leaving Jamaica, horrified as she looked at it curiously and got ready to spray it to see what it was. I yelled "It's pepper spray! I forgot I had it! I'm so sorry, please take it!" thinking I was going to be detained for having a weapon in the airport. They took it, shook their heads and waved me on. Kate - I've had peanut butter confiscated twice! Also lost a full large tube of Aveeno that was hiding in a backpack pocket and I thought I'd put it in checked. Paula - We had a bottle of bourbon in Japan, and the man at the airport said drink or throw it... we drank it and slept all the way home. Alyson - My son's Doctor Who toy nano sound recorder (it looks a bit gun-ish). Had it confiscated, and got it back again, very long story. I've walked through with a Swiss army knife by accident many times, not noticed. Pamela - We accidentally left hubby's Swiss army knife in carry-on. Amber - A soccer ball we bought in Bali got to the airport and was told we can't take it on plane unless it was deflated. It was 2:30am so of course I couldn’t get a deflator thing, so I had one very upset ten year old as he bought it with his own money. I wish someone had told me to deflate it beforehand as I haven't seen a ball like it since. Trish - Probably 20 years ago, my 7-year-old son carried on a bamboo crossbow from Thailand back to Australia! Try doing that now! Small nail clippers were confiscated from my carry-on. It did make me smile, the thought of me trying to kill, maim or hijack a plane with them. Sue - My son accidentally left a pocketknife he got at the Penang’s night markets in his daypack. He told me when we were mid-air. As we were stopping in transit in Singapore l told security because l thought we wouldn't get it through their security. The expression on their faces was priceless. They took it off us but returned it to us when we arrived in Australia, not without a talking to though. Wheels Wings and Wonder In Managua - I had an airplane-sized bottle of rum taken out of my liquids bag (sold as a souvenir in every market in Nicaragua) and a travel-sized hairspray - both fit within the acceptable liquids size and in the bag with my other liquids. Same trip - two different screening staff. Anne - Going to China they took my skin scissors which I had for over 40 years - best ever. Have never been able to get a pair as good since. The thing that got me the head part of the scissors were not even a quarter of an inch long, I don't know what they thought I was going to do with them… stab a fly? Jodi - Really miss being able to take my tweezers when we travel with just carry on & nail scissors. Robyn - Domestic flight security removed the nail scissors from a little manicure set I'd just been sent as a Christmas present from the UK. I beseeched them, hoping the Christmas spirit would win out. It didn't. P#@! ?d me off! Coral - Water and scissors. Really good nail scissors, packed in hand luggage by mistake. I can't see me ever be a carry-on only traveller for these reasons. I need tweezers and nail scissors. And clippers. It annoys me that you can buy most of the things you can't take through security, air side. Profit before security. April - I had a can of unopened Fois Gras taken from our hand luggage in Nice, France. I begged and pleaded with security and they made this big hoo-ha about how the tin can would be affected by decompression mid-air and potentially explode. Hmmm, sounds like a fairly plausible explanation, I thought and very sadly relinquished my very expensive take-home treat. After going through security however, what was the number 1 item for sale in the duty free food shop? None other than Fois Gras IN A CAN! Now I don’t know if they can make some specially anti-decompression type cans just for airports, but I highly doubt it and think those airport security guards had a very delicious dinner and a good laugh at my expense. Finelinetravels - Before we left on our rtw trip, my husband and I were flying back to Toronto after Christmas. Not thinking, I thought it would be smart to pack a new pink tool kit I'd gotten as a gift (drill, box cutter, hammer...) in my husbands carry-on to save weight in our checked bags.... Husband wasn't too happy when the airport security opened his carry on and there was the tool kit! HAHA. I'm a much smarter traveller now though. So what is that you managed to get away with? Or did you lose something you still regret years later? Tell us your story in the comments. Unintentionally, but I carried a box cutter in my carry-on about 8 months after 9/11. Passed through 4 different airport security checks, including one where we were tagged for "additional security" - they handchecked all of our carry-on baggage. Still didn't find it. I carried a chainsaw on carry on, on October 2001 from Chicago to Hawaii. The military security interviewed me, but it was not on their list of things to confiscate. I had to separate the Chain and the bar from it. I took a dog on our flight home from Mexico (we adopted her there) and barely anyone noticed. If we didn't tell anyone to pay the required fee I'm pretty confident we could have made it through without paying it. Whoops. After that many travels, I'm surprised that's all you have gotten confiscated Erin. My most common offense is water (I just forget going from one flight to the next) and I've had duct tape taken away as well. This was early after 9/11 heading to Hawaii. My pet peeve though is water! You buy the thing new bottle inside security from an airport vendor and they take it away as you board. This happens with U.S. carriers or carriers coming to the U.S. And with the TSA, you can't drink the water at the security, you have to back outside and do it. Almost all other countries you can though :(. And my wine bottle opener. Transited Istanbul with it and then on the way back headed into the city and it got confiscated on the way into the airport :-(. I had a bread knife once, so I could cut some cake I had and the guy took it away, So I told him, you know I can get another one from the Airport Club room right? Or better yet from the Flight Attendant on the plane. He said, he had to confiscate it. The problem is that you can't reason with these guys/gals as they won't have it. In the U.K., if they spot something they can't identify, even if you try to tell them what it is, its a 45 minute as they slowly take everything out of your bag, swab, show it to everyone and then re-run it and try to stuff it all back in. I politely tell them that I'll take over from here. A whole dog, Jeremy? Really? Did you hide him in your wife's handbag? Talking animals across borders is trouble dude, you can carry all kinds of diseases. I've carried Promite spread from Brisbane to Perth. So....back in the day, before dogs, I and many others managed to bring recreational party supplies all the time! My youngest daughter traveled to Italy one year with her boyfriend and his family. She bought a set of throwing spikes at some point in the trip, and brought them home in her carry-on luggage. Back in 1993, I smuggled a piranha from Paraguay to SLC, UT. It started out as frozen inside two or three plastic bags. It was mostly thawed by the time I got home. It was a special gift from a friend in Paraguay. I couldn't bear to leave it behind. I had to fly the day that terrorist plot with liquids was thwarted and airport security would not allow ANY liquids. I cried when they took my brand new tube of lip gloss! I was a broke college student and $10 was a lot of money to me haha. Years ago, when J was a baby, we snuck a TV through security at Ben Gurion airport in Israel. We perched J in his baby carrier on top and just pushed him through the nothing to declare line and we got through. It was all wrapped up in a bag and I still don't know how we did it. No harm done and the family got a TV they couldn't have otherwise afforded in Israel. 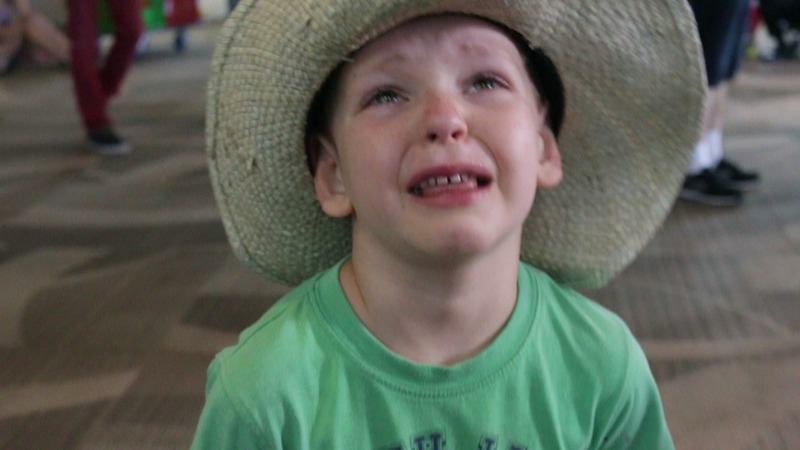 In Hawaii, I was surprised when TSA pulled a glass bottle of ketchup out of my son's backpack. Apparently, he had taken quite a liking to it at the restaurant. It was less than 3 oz, so I was able to squeeze it into our liter bag and bring it onboard. Hong Kong confiscated my daughter's rounded tip Winnie-the-Pooh scissors. i tried to explain that they use them out at kindy because even if kids stab each other with them, they do no harm. They wouldn't budge. On my return trip when visiting Australia, security gave me a hard time over a protein bar. They scanned my carry on bag several times, and then asked me to empty it. When I pulled out the protein bar, they said, "Ah, that's what that is!" and insisted that I couldn't take it on the plane! I told them I brought it into the country just fine, why couldn't I take it back out? Nope, had to chuck it in the bin. Went to New York recently for a week's vacation and had a small can of pepper spray in my carry-on luggage without incident. I've done the same thing a number of times before, but didn't know until today that it's not allowed in carry-on luggage. I carried it with me for most of the week until we went to visit the Statue of Liberty, at which time it is was confiscated. It surprised me quite a bit to find out that the Statue of Liberty is better protected than the airplanes flying throughout this country.